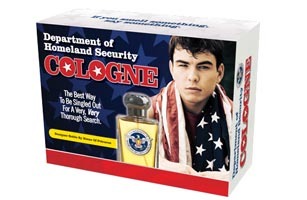 Department of Homeland Security cologne? A USB-powered toaster? Sure, these things don't actually exist, but this holiday season, go ahead and make your friends, family and new acquaintances at the TSA believe that they do. Satirical news site The Onion is offering a series of decoy gift boxes ranging from the items mentioned above to portable pet-feeding system designed like an iHome. Even though the box will still contain whatever last-minute gift you grabbed at the airport newsstand, it's what's on the outside that counts  in this case, a few fleeting moments of holiday cheer.